It wasn’t a particularly huge cookie, but I wasn’t aware that you could get a fresh baked anything in NY for less than a buck, let alone a pretty tasty cookie sandwich at a trendy bakery/bar in Soho. Sweet! The ladies of the wonderfully delicious Soho-based lunch blog, Lunch Studio recommended it to me. I just so happen to be attending a peanut butter sandwich-themed art show in the same neighborhood, so it seemed all too appropriate to accent the activity with a peanut butter sandwich cookie. The cookies were soft, a little light on the peanut butter and actually had a unique burnt flavor (that sounds bad, but it wasn’t), which I thought went well with the roasted peanuts. Taste Tester didn’t totally agree, but that just meant there was more of it for me (I love it when our taste disagreements result in me getting more of the stuff I like). There were plenty of other tasty-looking treats to pick from as well, many of which come recommended by Lunch Studio, so I’ll be back to try other treats they offer. 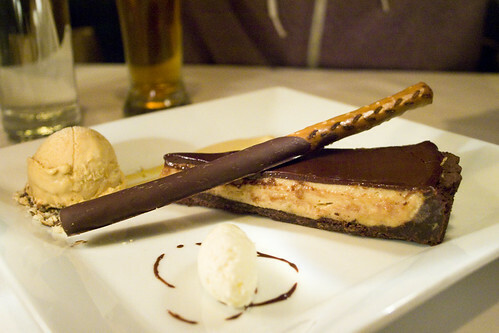 Incidentally, I also ended up consuming a chocolate peanut butter magic bar at the PB show and sharing a slice of chocolate peanut butter pie for dessert with Taste Tester at Lure later that night. I might have a problem. This wasn’t a particularly stand-out piece of pie, but I very much enjoyed hitting a trifecta of chocolate peanut butter desserts in one day. In hindsight, Taste Tester actually enjoyed the pie more than I did so I guess it all worked out for us in the end. 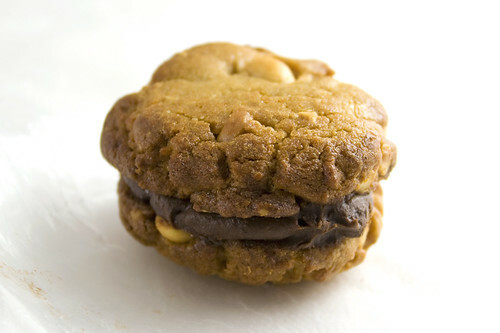 Check out Oro Bakery and Bar for a peanut butter sandwich cookie or, make one yourself! It’s been a while, but I remember this Everyday Food recipe being kind of similar in flavor to Oro’s sandwich cookie – just add some chopped up peanuts to the dough before baking. Enjoy! Hi there! Sorry to hear the pie was underwhelming :( Here is my recipe for Chocolate Peanut Butter Pie – its one of my favorite CPB sweet treats. Give it a try!